What can I say, this past Sunday’s episode was siiiiiiick. We took a gander at the world of social media marketing, each of us making both a solo selfie video, and a group viral video. And in the viral video challenge, MY TEAM WON! Since this episode didn’t contain any actual cooking, it seems to have been a bit controversial amongst fans. But truth be told, we had a BLAST filming it. Working with Emma and Reuben was a dream. I love those crazy kids. Or should I say niños locos? In my selfie video, I started off at ease, but quickly got nervous trying to remember everything I wanted to say. And as a result, I fell into my fake, trained broadcaster voice. In this competition, that’s been the toughest obstacle for me to overcome. You see, when I’m nervous, I try extra hard to sound like I’m not. So I overcompensate, and then it comes out sounding really put on, and not at all authentic. If it sounds like I’m trying too hard, it’s because I am. When I heard myself say the pantry was “sick,” it made me cringe. In part, because, well, yeah. IT’S A TERRIBLE WORD TO USE TO DESCRIBE FOOD! But, in all honesty, it’s a word I use quite a bit at home around my friends. It’s just common vernacular in my circle. When presenting myself in the business world, I put on a professional persona. I mean, don’t most people conduct themselves differently in a business meeting than when out at a bar with friends? Here’s the thing: I went out to compete on Food Network Star because I want this to be my career. So naturally, I’m inclined to treat this more like a job interview than a night out partying. But the network, and America, wants to see the real me. Low-key viewing party with Dad and Chaser. Not pictured: Ems and her delicious apple pie. For the record, my dad still can’t roll his R’s. So what I’ve really struggled with is how to find that sweet spot between the Nicole I am in the professional world, and the Nicole – or rather, Coley – I am around my friends. How do I find the balance between being professional and polished, and being the sarcastic, opinionated, slang-talking person I am at home? It was much easier for me to open up and be myself in the group challenge, because I was surrounded and supported by two friends, Emma and Reuben(cito). Working with them INSTANTLY made the challenge more fun. Being able to collaborate took a lot of the pressure off, too. In other challenges, we aren’t allowed to consult with anyone about our ideas. You decide what you’re going to do, and that’s it. I never realized how much I value other people’s opinions until put in a situation where I wasn’t allowed to seek them. It’s hard to have 100% confidence in what you’re doing without first bouncing your ideas off of someone you trust. The friends I made while filming this show have turned into family. 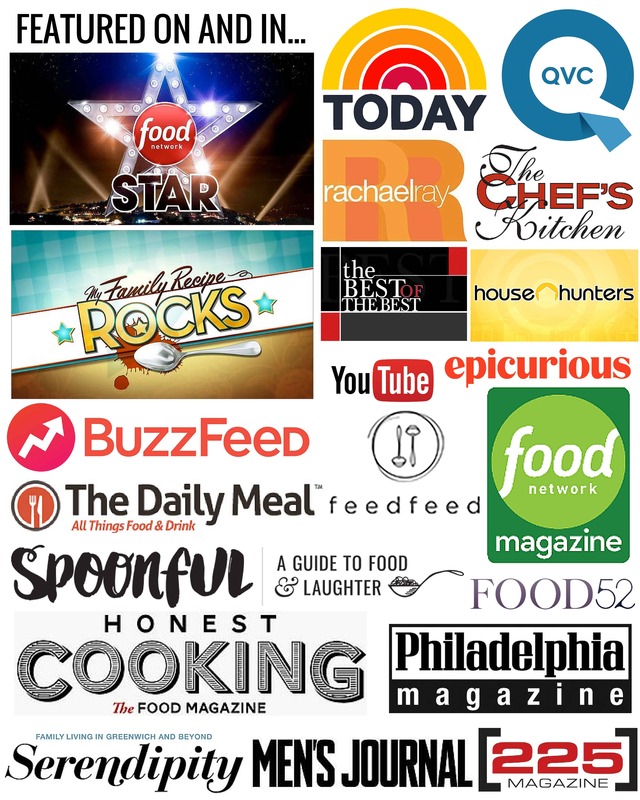 The Food Network Star family. Going through a unique situation with a small group of people for an extended period of time forces you to bond, and to bond quickly. I remember seeing everyone that first day, and just thinking, “WOW, look at all of us us! We are each a walking caricature of a stereotype.” A group of people as diverse as us would never come together to become friends under any other circumstance. But we did become friends, and what brought us all together was our love of food, and our innate desire to share that love with the world. We were all anxious about who was going to be sent home, because the criteria for this week’s challenge seemed so arbitrary. While social media is a huge part of our world today, and something I enjoy doing (Hey look! I’m blogging! ), I didn’t think the elimination challenge really gave any insight into who would make a good Food Network Star. It didn’t involve any cooking, or really talking about food at all. It was more like acting. But this competition is supposed to be about getting America to see who we really are, and I guess that’s where I got confused. I thought Aryen really put herself out there and shined in this challenge. It was the first time all season that I saw the real true Aryen that I knew behind the scenes. …No, I don’t mean a weird hunchback lab assistant. I’m talking about a girl who doesn’t mind getting goofy and poking fun at herself. Sometimes, all she had to do was look at me the right way and I would crack up. My absolute favorite memories from filming are from when we would all sit and joke around together. Aryen’s laugh is infectious, and we would both catch a bad case of the giggles after long storytelling sessions with Jackie and Tamar in the makeup chairs. Was she a little hard to understand in the video? Maybe. But I thought she NAILED that performance. It was weird, funny, and a little bit creepy- everything that it was supposed to be, and more. I felt absolutely crushed for her when she told us it was her time to go. But that’s the thing with filming this show. You form friendships with these people. And then one of you gets their dream crushed, and one of you gets to stay. And it’s weird. Because you feel bad – really bad – but you’re also happy that it’s not you. It’s a mind-boggling mix of emotions that only gets harder as the weeks progress. Tune in next week as we get back to cooking, and celebrate the 4th of July- My all time FAVORITE holiday! Questions? Comments? Leave em’ down below! Vote for me for Fan Favorite! Watch a video recap of Episode 4 and a sneak peak of Episode 5! Watch Aryen, Luca & Chad battle it out in Star Salvation! As always, I loved your blog! You are so descriptive and do provide great “back story” insights. I can’t wait to see this week’s episode, and a return to cooking. Also, just for the record and I don’t know if Ems told you, but we learned to make that “sick” apple pie from our grandmother, much like you learned a bunch about your food from your grandmother. Love the snap with Bobby Flay! I was going to recap the show but instead I am going to link to your recap and make people vote for you. This was a fun recap. I came over due to a post on another blog (see below*), now realize the error in my ways and will need to catch up with Next Food network Star on demand immediately. Good luck! Now I need to make accounts in all my children’s names so I can vote for you 50 times a day or whatever. Note: I am no way affiliated with superficial or Acadia Einstein, just looking for cool stuff.